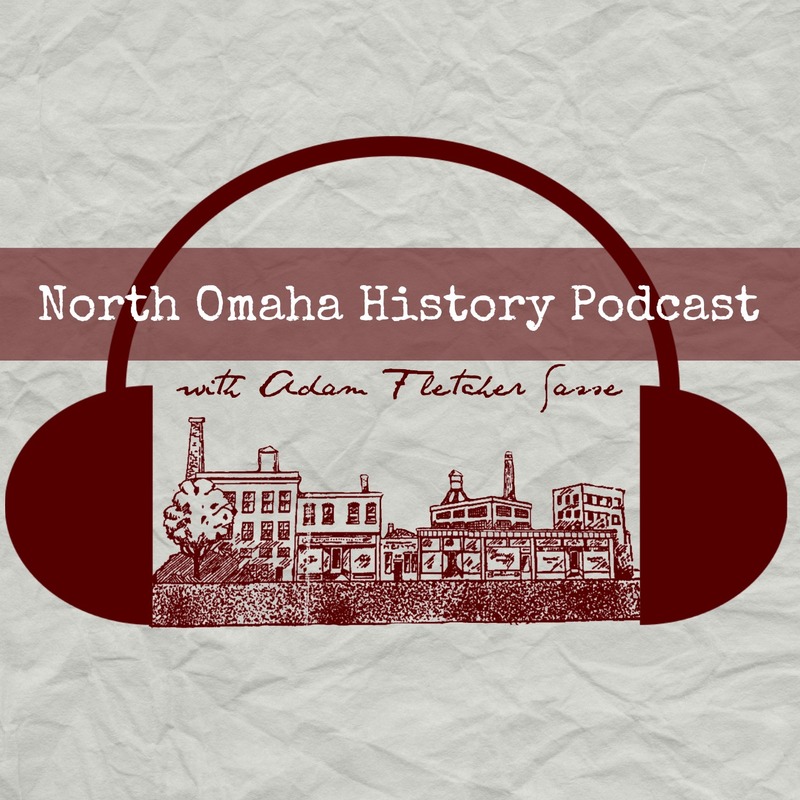 From June 1st to November 1st in 1898, North Omaha played to the biggest, grandest, most popular event to ever happen in the City of Omaha and the State of Nebraska. Over the years, it’s been the fodder of hundreds of historians who’ve reveled in the pomp and circumstance, plastering wonderful pictures of Grecian style temples and other Gilded Age glories through books and the Internet. However, aside from lamenting the loss of these wonderful buildings and idyllic space, few people have said much about the demolition of the exposition grounds. Now entirely lost in the neighborhood, there are no actual traces and few signs of what once existed. A few years ago, Michele Wyman, Ryan Roenfeld, Michaela Armetta and Micah Evans started unweaving some of the mysteries of this grand place with me. This article is an account of some of what we’ve found regarding the demolition of the expo grounds in North Omaha. This is the east end of the Grand Court at the expo grounds in North Omaha. It was located near the present-day North 16th and Spencer Streets. Called the Trans-Mississippi and International Exposition, the first expo in North Omaha was the dream of businessmen and political leaders who were hellbent on making sure Omaha remained a significant city in the Midwestern United States during a long recession. They succeeded spectacularly. From July 1st to October 31st of 1899, there was a carry-over event called the Greater America Exposition held at the same location. Using the same buildings, amusements and similar activities, the second shot didn’t work as well as the first. Tremendous archways, palatial walkways and seemingly magnificent statutes. But it was intentionally built cheap and temporary—this was the only way Omaha could afford such a spectacular place! Almost all of the construction was simply smashed up and hauled away or used as fill. Out of almost 100 buildings and dozens of other features, none of it was left in place. Following is how it happened. The New York Building was the image of an upstate New York estate. After the expo it was reportedly dismantled and used as a home. The Trans-Mississippi Expo, or TME, ended on November 1st of 1898. Three days after, the first building to be torn down was the Kansas building. A man named Gus Peterson then bought the New York Building and converted into a “double dwelling,” which must mean a duplex. The next day, the Nebraska Building was moved somewhere else in the city and converted into state government storehouse. The Iowa and Wisconsin Buildings were destroyed soon afterwards, and within the same week, several of the smaller buildings on East Midway were demolished. These buildings housed concessions and some amusement centers. Several other buildings were re-used elsewhere, but I haven’t found specific details on where or how. The Greater America Exposition featured American colonialism and racism predominately. Plans for the Greater America Exposition in 1899 were floating around Omaha all summer long, and by November 8th, 1898, many of the states and amusement operators were waiting to see what was going to happen. On November 11th, Peter Iler and his brother Joseph submitted a proposal to the TME Board of Directors to buy the expo grounds for $10,000. The board wasn’t anxious to sell it though, apparently because they were afraid of screwing up their legacy. According to minutes from their meetings, they wanted to know a worthy successor would take over the property, and work on the TME began dawdling. The organizers of the German Village at the TME had a lot of claims against their work though, and on November 23rd, the German Village was auctioned off to cover their debt. To show the cheapness of the buildings at the expo, check this out: In November 1898, the Nebraska Building was sold for $470 to a new company. That amount in 2015 dollars? $12,819.99. These weren’t well-built structures, and people then knew it, even if people today don’t quite understand or accept that. The Minnesota Building was demolished by December 1898, and a part of the lagoon was removed because of leaking. The giant electrical fountain in the lagoon was taken out, too. The rest of the expo grounds were deserted, and complaints about its condition began piling up. The expo grounds were located in the Kountze Place neighborhood in North Omaha. Established by banker Herman Kountze 15 years earlier, Kountze Place was a streetcar suburb built for businessmen who wanted to escape the hustle and bustle of downtown Omaha. When their neighborhood was built up as a playground for the masses, surely there was bound to be trouble. One look that trouble took was regular complaints to the Omaha City Council, the Omaha Bee and the Daily World-Herald newspapers, and other protests. For instance, on December 31st, 1898, the Kountze Place Improvement Club submitted a lengthy protest to a variety of authorities and the media about the filthy streets, trash-strewn walkways and degraded buildings at the expo grounds. The public outcry led to a cleanup, but that still wasn’t enough and the club kept complaining. As winter pummeled Omaha in 1898-99, nothing significant happened at the expo grounds for the next several months. However, plans for the grounds solidified and the Greater America Exposition, or GAE, was slated to happen. In late March, 1899, the Chicago Wrecking Company sold the Government Building to the GAE Board of Directors, and the plans for the GAE steamed forward. Shown here are several images from the demolition of the grounds for the Trans-Mississippi Exposition (1898) and the Greater American Exposition (1899) in North Omaha. The Greater American Expo didn’t go well, and when it closed everyone was anxious to see it go. The railroad brought a trainload of demolition equipment from Chicago at the beginning of November, 1899. The Greater America Expo had ended, many of the large debts were paid to creditors, and the City of Omaha and State of Nebraska governments were both anxious for the temporary structures at the expo grounds to be demolished. 500 workers were employed to demolish the expo buildings, features and fixtures. Within the next month, all of the displays were emptied and shipped away, and there was a lot of activity on the site of the Trans-Mississippi Expo and the Greater American Expo. Opportunists moved in, especially thieves and rebuilders. The rebuilders were innocuous, simply buying buildings and rebuilding them in other places. The Giant Seesaw went to Coney Island in New York City, where it became a fixture for another decade. Wood was reused for corn cribs, and the merry-go-round was taken to Cortland Beach on Carter Lake. The thieves were supposedly particularly heinous and brash though. On November 10th, 1899, they were caught openly stealing lead pipe and plumbing materials from buildings. Throughout the rest of the demolition, they went for copper, iron and ornamental brass, too. The Chicago Wrecking Company, or the CWC, was contracted for the equipment, hiring workers, and the overall demolition of the expo grounds. Their initial plans proposed that the demolition and rehabilitation of the grounds would take six months from November 1899 to May 1900. Every building was demolished because every building was built to be temporary. The Chicago Wrecking Company planned to save everything in demolition except the staff, which was the plaster used to cover buildings, mould statues, cover railings and otherwise be the white surface many people loved about the expositions. It was a temporary material, and deteriorated quickly. Much of the debris was sold quickly, and some buildings were wholly reused in other places in Omaha and beyond. Brick sidewalks were taken out, paver by paver, and reused elsewhere. Trenches were opened to remove the temporary piping for buildings, and apparently, minarets and domes were rolled around the grounds after being taken off their towers and buildings. The lagoon sat untouched for weeks, and the scenic railway just stood there, empty and idle, for months. This is the demolition of the east court of the expo grounds, with the Administration Building to the left. By the end of November 1899, the so-called “White City” became the “Gray City,” and newspapers ran headlines like, “The Ripped Fabric of Great Dreams” to describe the demolition. The Mining Building and the Colonial Building were demolished by December. There was a long autumn that year, and into December the work continued. That month, the temporary lighting for the expositions was replaced, and many of the flickering dynamo lights were replaced with permanent street lamps. The Midway was entirely demolished by the middle of November, as well as the Electricity Building and others. The lagoon was still intact though. By the end of the December, the Manufacturing Building was gone. The huge Horticulture Building and the Fraternal Building, as well as the Government, Fine Arts and Liberal Arts Buildings had not been touched. By the end of the month, the German Village and Giant Seesaw were all that was left on the Midway. The largest building at the expo grounds was the Agriculture Building, and it was entirely demolished by April. A huge fire destroyed the Transportation Building that month, including the windows and lumber stored there. That same month, the Philippine Village was bulldozed, along with the Chinese Village and Battle of Manila building. Two water buffalo were “accidentally” killed while this was going on. By the middle of April 1900, the demolition was nearly done. The Apiary Building was the largest one left by April 15th when the Chicago Wrecking Company declared demolition done. All their salvage materials were sold by then, but wouldn’t be finished being hauled away for two more months. There is one interesting story about a sod house that lasted to June 1900. But that was anomalous; the rest was all gone. Several interesting things happened to some architectural artifacts of the expos, including the one in this story by Michele Wyman. Use the comments below if you know of any!